Within his small workshop in Zejtun, 68 year old silversmith Joseph Aquilina, can still do wonders with precious metals. 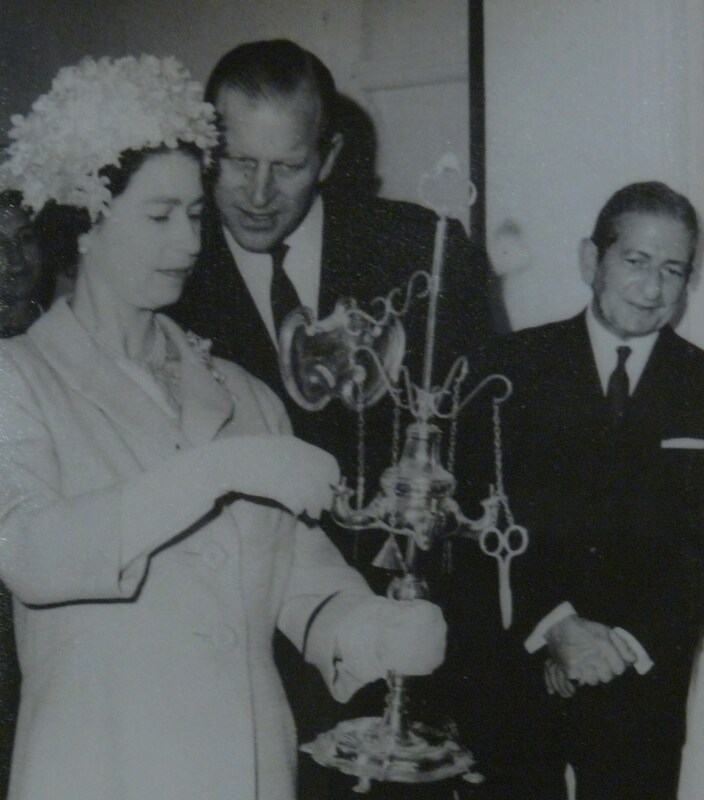 Having worked as a silversmith from age 14, he has gained so much mastery in this trade that one of his creations was donated to Queen Elizabeth II during the celebrations of Malta’s Independence in 1964. 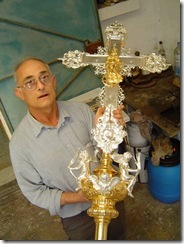 Nowadays, his expertise is particularly focused on the restoration of antique objects which adorn our churches. Aquilina learnt this trade from his father Joseph who was originally from Cospicua. 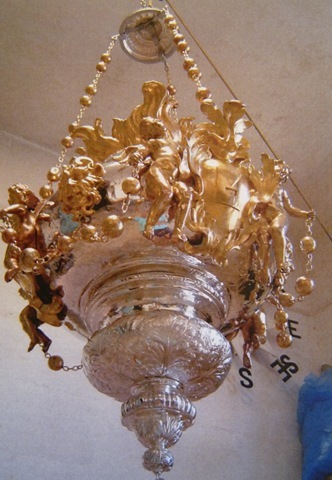 Before World War II, Cospicua was renowned for some of the most skillfull silversmiths who eventually had to move to other areas in Malta when this zone became a target to heavy attacks and bombardments. 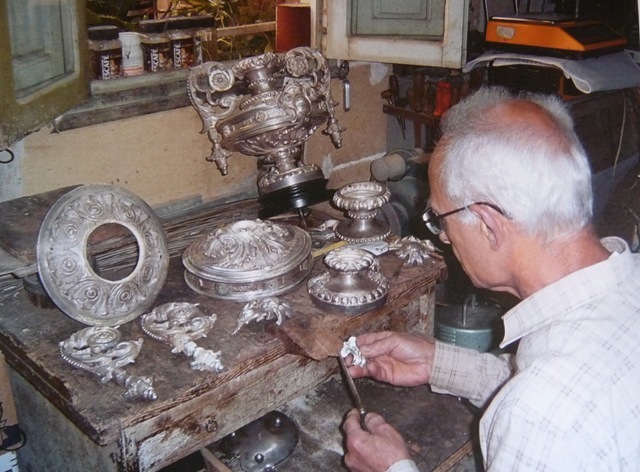 From early childhood, Aquilina was very interested in his father’s work and he spent hours observing him working silver items in his shop at St Mary Square in Zejtun. 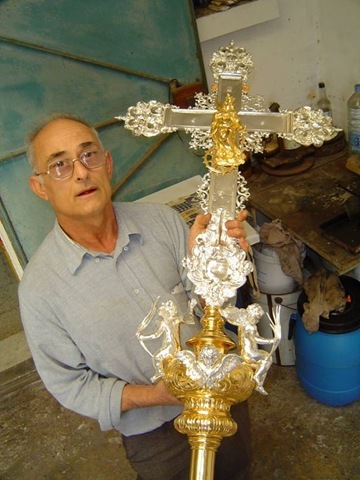 At age 12, he used to rush at the shop immediately after school in order to join silver beads together to produce rosaries for his father’s clients. Aquilina knew that he was hooked to this trade but he never dreamt that at age 14, he would be obliged to choose between attending school and becoming a silversmith! It all happened when one day, a social service inspector called at their shop and found him doing some work. It was useless to insist that the boy was only helping his father because the inspector maintained that if the boy wanted to stay in the shop, he had to register for employment within 15 days. And that was the end of his schooldays. “School meant nothing to me at that time and I thought that it was a great opportunity to start doing what I was really passionate about. However, when in later years I had to manage my business and was faced with several difficulties due to my brief education, I realized that leaving school at such an early age was definitely a huge mistake,” admitted Aquilina. His father was greatly disciplined in his trade and he demanded the same diligence from his son. Above all, he wanted to pass to him all the knowledge that he had inherited from past generations. 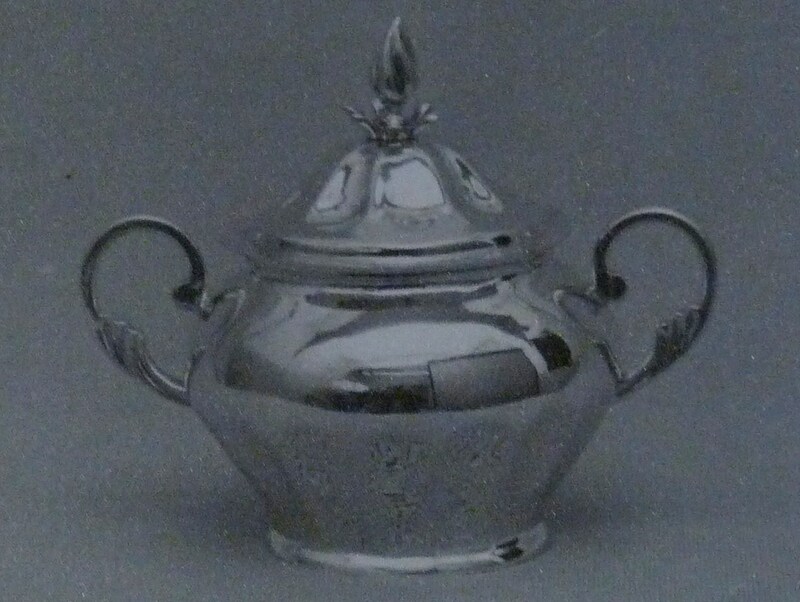 Yet this was no easy task since the silversmith’s trade expands vastly and covers areas which include work in silver, gold, filigree and the setting of diamonds. Interestingly, Aquilina succeeded to attain his father’s complete trust by disobeying him. Yet one day, Aquilina felt confident enough to try his luck by operating the soldering equipment which his father had adamantly prohibited him to use. Indeed, whilst his father went to church to attend a Lent sermon, Aquilina asked his mother to give him her gold wedding ring in order to cut it in half and reconstruct it again. His mother accepted without a second thought and Aquilina hurried to the workshop, broke the ring in two, switched on the gas, prepared the soldering equipment and trembling with excitement, he quickly joined the two parts together. He did such an excellent job that his mother could not identify any signs that her ring had been broken, and when she told her husband about this and he inspected the ring, a bright smile lit on his face. His son had finally made it! 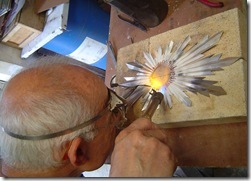 From then on, Aquilina had his father’s complete respect and he started to produce his own creations for their clients. He had learnt this trade in the traditional way where everything was done by hand, and to keep in line with this method, he decided to focus on the antique style. This stratagem worked perfectly with those connoisseurs who appreciated refined local craftsmanship. Some of Aquilina’s works have often been selected to be given as gifts to foreign individuals. Meanwhile, even though throughout the years, there were many machines available which could ease the difficulty of the job and hurry the flow of work, Aquilina always refused to use them. In order to design and work his particular creations, at times Aquilina had to manufacture his own tools. Yet apart from the ingeniousness required in order to assemble these devices, it was fascinating to know the stories behind the origin of some of the material. Certainly, I did not have the slightest idea. Another curious fact about this trade is that whenever a new silversmith is authorized to start his/her business, he/she is given a personal stamp with which to mark each object that they make. This stamp will be unique and it cannot be transferred to another person. 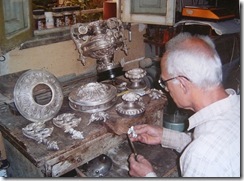 Therefore, each silversmith’s work can always be recognized, no matter how much time elapses. In order to explain better, Aquilina referred to an old and rare book ‘The Goldsmiths of Malta and their Marks’ (1972) which was published by Chev Victor Fredrick Denaro; a pioneer in the study of ancient silver in Malta. In this book, one finds significant information about the ancient trade of silversmiths which goes back to the period of the Knights of St John. Meanwhile, this publication includes also all the local silversmiths’ stamps together with their relevant details; starting from the Knights period up to 1972. “This book is very precious to me particularly because it helps me to identify the silversmiths of the antique objects which I work on. This will also determine the period of the objects’ manufacture with more precision, and thereby I can understand better which materials and which procedures were involved in its making,” explained Aquilina. The restoration of antique metal objects requires high expertise and attention since one small mistake could ruin them completely. 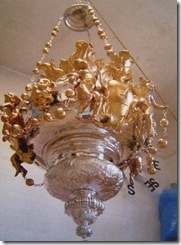 Indeed, in these last years Aquilina was responsible for the restoration of various treasured items which include: the restoration of the silver crown of the icon of the Madonna of Carafa that is located within the Co-Cathedral of St John in Valletta, the restoration of the silver leaves that form part of the decoration of the relic of St John the Baptist which is situated in the Museum of the same Co-Cathedral, and in the restoration of the sword of the titular statue of St Catherine in the Parish of Zejtun. Xi ftit tax-xhur ilu kelli l-opportunità li niltaqa’ mal-arġentier Tarcisio Cassar fuq il-post tax-xogħol tiegħu li kien miżgħud b’għadd ta’ għodod u xogħolijiet lesti għall-bejgħ. Huwa laqgħani bi ħlewwa liema bħalha u dlonk qabad jagħtini ħjiel dwar is-sengħa antika u tradizzjonali tiegħu. Ftehemna li nerġgħu niltaqgħu darb’oħra sabiex nintervistah imma dan qatt ma seħħ għax xi ftit taż-żmien ilu, Tarcisio ħalla din id-dinja u jiena tlift iċ-ċans li niret mingħandu l-għerf li ħallewlu missirijietu. Għaldaqstant meta dan l-aħħar intlabt minn Wirt iż-Żejtun sabiex nintervista lill-arġentier Joseph Aquilina, ħtaft mill-ewwel l-okkażjoni. Waqt il-laqgħa li kelli ma’ Joseph intbaħt li jiena trabbejt u għext viċin il-post fejn dan l-individwu ħadem xogħolijiet kbar, imma b’danakollu ma kellix l-iċken idea tiegħu! Ma kienx hemm dubju li kien wasal iż-żmien biex nolqtu żewġ għasafar b’ġebla waħda u minnufih involvejt ruħi biex nistħarreġ l-istorja li tinsab wara din is-sengħa. Joseph ħadni lura lejn is-snin tletin hekk kif rama jirrakkuntali dwar iz-ziju ta’ missieru, Carmelo Caruana, li kien arġentier Bormliż. Jidher li qabel it-Tieni Gwerra Dinjija, Bormla kienet waħda mill-bejtiet tax-xogħolijiet tal-arġenterija u hemm wieħed seta’ jsib nies ta’ sengħa mill-iprem. Wieħed minn dawn kien Xandru Cassar u miegħu eventwalment laħqu wkoll uliedu, Joe u Salvinu. Peress li dawn kienu ġirien ma’ Carmelo, huwa ma damx ma beda jieħu interess f’dan il-qasam u aktar tard, meta fl-1938 ġab il-liċenzja ta’ arġentier, huwa beda jaħdem bħala lavrant magħhom. Iżda l-gwerra ċaqalqitu minn Bormla u Carmelo mar joqgħod iż-Żejtun, fi Triq Marsaxlokk, fejn fetaħ ħanut u baqa’ jaħdem fih għal ħafna snin. Anki missier Joseph, li kien jismu wkoll Joseph u bħal zijuh kien Bormliż, trawwem f’din is-sengħa u bħal Carmelo, huwa għamel karriera twila jaħdem ma’ Xandru Cassar. Madanakollu ġie żmien meta l-paga ta’ sebgħa liri fil-ġimgħa ma setgħetx titma’ sewwa lill-familja tiegħu li diġà kienet tikkonsisti minn tliet ulied, u b’hekk huwa ddeċieda li jiftaħ għal rasu. Peress li anki hu kien ta’ ħila kbira, ma damx wisq biex qabad fix-xogħol tiegħu bħala arġentier mill-ħanut li fetaħ fi Pjazza Santa Marija, iż-Żejtun. U minn dal-post bdiet ukoll il-ġrajja ta’ Joseph li ftit ftit ma damx ma ddakkar minn missieru u ta’ tifel li kien huwa beda jitħajjar jipprova jaħdem xi ħaġa żgħira. Infatti ta’ 12 il-sena, wara li tispiċċa l-iskola, huwa beda jinxteħet wara l-bank tax-xogħol ta’ missieru fejn kien jitħalla jsensel il-kuruni tar-rużarju li n-nies kienet tordna f’dak iż-żmien. Dinjet Joseph kienet diġà bdiet ixxaqleb lejn din is-sengħa tal-arġenterija imma d-destin ried li r-ritmu li jidħol fiha, ikollu pass ħafna aktar mgħaġġel. Dan seħħ meta għodwa minnhom, daħal spettur tas-servizzi soċjali fil-ħanut tagħhom, u sab lil Joseph wara l-bank. U akkost li missieru spjegalu li ibnu kien qiegħed jitħarreġ biss u mhux jaħdem miegħu, dan l-ispettur tah ħmistax ċans biex jagħmillu l-ktieb tax-xogħol. Ħabta u sabta, fl-età ta’ 14 il-sena, Joseph sab ruħu jinqala’ minn fuq il-bank tal-iskola sabiex minflok jidħol fid-dinja tal-adulti. Huwa stqarr li dak iż-żmien ma ħadhiex bi kbira li kellu jitlaq l-iskola iżda aktar tard, meta kiber fis-sengħa tiegħu u sab ruħu fi stat li jrid jikkomunika ma’ nies f’pajjiżi oħra, Joseph intebaħ li fir-realtà kien ikun aħjar li kieku tħalla jkompli l-iskola sal-aħħar. Missier Joseph kien bastun fuqu u sikwit kien iwissieh li din is-sengħa riedet tittieħed b’serjetà kbira għax kien hemm ħafna x’titgħallem u daqstant ieħor fejn tiżbalja. Għalhekk għall-ewwel, it-tfajjel kien joqgħod kemmxejn lura milli jipprova xi ħaġa ġdida. Imma ġara li darba minnhom, avolja kien jibża’ ferm minn missieru, huwa ppjana li jagħmel waħda minn tiegħu ħalli jara sa fejn kien kapaċi jasal. Kien żmien ir-Randan u waqt li lejla waħda, missieru rħielha lejn il-knisja biex jisma’ l-eżerċizzji, Joseph mar għand ommu u talabha tagħtih iċ-ċurkett tat-tieġ ħalli jaqsmu u jerġa’ jsewwih sakemm missieru jiġi lura. Ommu ma ħasbithiex darbtejn biex tagħtulu u hu kollu eċitament erħilha jaqsam iċ-ċurkett fi tnejn, iqabbad il-flixkun tal-gass, jipprepara s-saldatura tad-deheb u ħafif ħafif, jgħaqqdu lura mill-ġdid. Il-pjan tiegħu rnexxa qatiegħ tant li ommu baqgħet skantatha għax ma setgħetx issib tarf minn fejn binha kien qata’ ċ-ċurkett u reġa’ għaqqdu flimkien. U hekk kif żewġha ġie lura hija qaltlu bil-kapaċità ta’ binhom u dan tant impressjona ruħu li minn dakinhar ‘l hemm, it-tiswijiet li bdew jidħlu l-ħanut kienu jispiċċaw kollha direttament għand Joseph. Finalment l-iben kien rebaħ il-fiduċja assoluta ta’ missieru u minn hemm baqa’ għaddej u ġab il-liċenzja ta’ arġentier fl-1968. Fatt kurjuż huwa li meta wieħed isir arġentier, il-Konslu tal-gvern jagħtih boll personali sabiex bih huwa jimmarka x-xogħol tiegħu. Dan il-boll jibqa’ marbut ma’ dak l-individwu partikolari u ħadd qatt aktar ma jista’ jużah. Sabiex jispjegali aħjar, Joseph urieni ktieb rari mmens ‘The Goldsmiths of Malta and their Marks’ li ġie ppubblikat fl-1972 minn Chev Victor Fredrick Denaro, pijunier tal-istudju tal-fidda antika Maltija. F’dan il-ktieb kien hemm informazzjoni dwar is-sengħa tal-arġentiera Maltin li tmur lura sa minn żmien il-Kavallieri ta’ San Ġwann u twassal sa snin aktar riċenti. Fosthom wieħed jista’ josserva l-marki tal-boll differenti tal-Maltin li ħaddnu din is-sengħa, inkluż dawk ta’ Joseph u tal-familjari tiegħu. Intant, kien permezz ta’ dawn id-dettalji li darba minnhom huwa skopra min kien għamel il-bieba tat-tabernaklu tal-Parroċċa taż-Żejtun, hekk kif waqt li kien qed jaħdem fuq il-parti ta’ ġewwa tiegħu, Joseph intebaħ bill-boll tal-arġentier Lebrun li kien jinsab imnaqqax fuq naħa minnhom ta’ dan ix-xogħol. Għalkemm jiena kont naħseb li l-arġentier jaħdem biss fuq il-fidda, ir-realtà hija ferm differenti. Fil-fatt l-arġenterija għandha taqsimiet enormi fejn tespandi u fosthom tinkludi: xogħol tal-fidda, tad-deheb, u tal-filugranu, is-separazzjoni tad-deheb u l-ħidma tal-fidda, u anki l-ingastatura tad-djamanti. Illum, ħafna minn dawk li jagħmlu dan x-xogħol ta’ arġentiera, jkollhom jispeċjalizzaw f’xi taqsima partikolari. Imma dari l-istorja kienet mod ieħor, hekk kif wieħed kien ikollu jmidd idejh u jitħarreġ fuq diversi fergħat ta’ din is-sengħa. Hekk tgħallmu l-antenati ta’ Joseph u l-istess għamel hu. Madanakollu hu nsista aktar minn darba li s-sengħa tal-arġentier hija bla tarf u wieħed mhux la kemm jibda jaħdem kif ġieb u laħaq. Trid diversi snin ta’ taħriġ qabel tibda taħdem waħdek u huwa għalhekk li min ikun jixtieq jieħu dax-xogħol bis-serjetà, idealment jibda minn meta jkun għadu żgħir. Joseph tħarreġ fuq din is-sengħa bil-mod tradizzjonali fejn ix-xogħol isir kollu bl-idejn. U anki jekk illum jeżistu diversi magni li jħaffu aktar u jnaqqsu ferm it-tbatija minn dan ix-xogħol, huwa baqa’ dejjem juża l-metodi antiki minħabba li jemmen li hu hekk biss li jista’ jinżamm il-prestiġju u l-valur tal-ħidma tal-oġġett. Infatti huwa saħaq li x-xogħol li jsir bil-magni jitlef ħafna mis-sinifikat tal-oġġett għax dawn jisirqulu l-għerq tal-kreattività u tat-tiswira distinta tal-id tal-bniedem tas-sengħa. Sabiex nifhem aħjar dan il-kunċett, Joseph beda jurini l-għodda u l-mezzi li juża biex jaħdem u hemmhekk għaraft il-paċenzja, il-galbu u t-talent li wieħed jirrikjedi biex jazzarda jaħdem f’dan il-qasam. Intbaħt ukoll li l-kreattività ma tintużax biss fl-oġġetti li jinħadmu imma anki f’aspetti oħra, hekk kif wieħed li jagħżel li jibqa’ jaħdem bl-idejn, ikollu jara x’ser jivvinta biex isewwi jew joħloq l-għodda neċessarja. Intant bqajt skantata mhux ftit meta fost l-għodda li kellu, Joseph ġabli mazza tqila mmens u martell tal-inkavar li huwa kien sawwar minn numru ta’ boldijiet li kien ġabar fl-1969 mill-inħawi tal-Gżira, fl-inħawi ta’ Wied il-Għajn, fejn kien qed jitqatta’ l-bastiment Angel Gabriel, li kien inkalja fil-post fejn aktar tard kienet inbniet il-lukanda Jerma Palace. Il-Maltin minn dejjem kienu mdorrijin jirranġaw b’xi mod jew ieħor u hekk ukoll għamlu fiż-żminijiet ta’ wara l-gwerra meta fil-pajjiż kien hawn nuqqas ta’ kollox. Fil-fatt Joseph irrakkuntali illi fi żmien iz-ziju ta’ missieru Carmelo, in-nies kienet daret għall-muniti tal-flus biex tkompli tipproduċi l-oġġetti li xtaqet, anki jekk dan kien att illegali. Min jaf kemm liri tad-deheb inħallu sabiex minnhom jinħadmu xi par imsielet, ċrieket, labar u brazzuletti! Fost dawn jingħad li l-lampier il-kbir tal-fidda li jinsab imdendel quddiem l-artal maġġuri tal-Parroċċa taż-Żejtun kien inħadem minn numru kbir ta’ muniti li waħda mara tat lill-knisja bħala donazzjoni sabiex jitwettaq dan ix-xogħol. Bl-istess mod jidher li saru l-par lanterni antiki tal-fidda li llum jinsabu fil-Mużew tal-Parroċċa taż-Żejtun. Ħsibt li s-sorpriżi kienu spiċċaw imma konna għadna biss fil-bidu, hekk kif Joseph beda joħroġ diversi ritratti sabiex jintroduċini mal-oġġetti li huwa ħadem. Infatti huwa ħadem diversi affarijiet b’xogħol immartellat, kollu fuq stil antik, li llum jinsabu fid-djar tal-aqwa kollezzjonisti Maltin. Madanakollu, apparti l-kwantità ta’ zukkarieri, buqari tal-ħalib, kafettinieri u oġġetti oħra li ħarġu minn taħt idejn Joseph, kien musbieħ partikolari li fetaħlu l-bibien biex il-krejazzjonijiet tiegħu jsibu ruħhom anki barra minn Malta u fosthom għand persuni distinti bħar-reġina tal-Ingilterra li ngħatat wieħed minnhom mill-gvern ta’ Malta fl-1964, waqt l-okkażjoni taċ-ċelebrazzjoni tal-Indipendenza, u għand il-Pakistan International Airlines meta pajjiżna ġab l-ewwel ajruplan tal-Air Malta. Joseph kien involut ukoll f’numru vast ta’ xogħolijiet fil-knejjes, kemm ġodda u kif ukoll ta’ restawr. Fost dawn nista’ nsemmi: il-kuruna tal-fidda bbanjata bid-deheb tal-ikona tal-Madonna ta’ Carafa li tinsab fil-Kon-Kattidral ta’ San Ġwann, il-belt Valletta, ir-restawr tal-weraq tal-fidda li jiffurmaw parti mid-dekorazzjoni tar-relikwa ta’ San Ġwann il-Battista li llum qiegħda fil-Mużew tal-Kon-Kattidral, ir-restawr ta’ lampier tal-1776 li jinsab fil-Knisja ta’ San Pawl, ir-Rabat Malta, u xogħol fuq ix-xabla ta’ Santa Katarina fil-Parroċċa taż-Żejtun. Issa li Joseph Aquilina l-arġentier għandu 67 sena, huwa stqarr li mhux darba u tnejn li jħares lura lejn il-passat tiegħu u jħossu sodifatt ferm bl-esperjenzi differenti li dan ix-xogħol laqqgħu magħhom matul is-snin. Barra minn hekk huwa jħossu kburi li rnexxielu jkompli b’suċċess is-sengħa li ħallewlu missirijietu, flimkien ma’ ħuħ Emmanuel li wkoll jagħmel l-istess xogħol. Intant, għalkemm ix-xogħol tal-idejn qiegħed dejjem jinqata’, kemm minħabba l-iżvilupp teknoloġiku u anki sforz l-importazzjoni ta’ oġġetti barranin li jiswew prezzijiet anqas, Joseph jinsab kuntent li ibnu Anton wiret mingħandu l-imħabba u t-talent lejn din is-sengħa, tant li llum anki huwa għandu l-liċenzja ta’ arġentier. B’hekk huwa jittama li l-ġrajja tal-arġentiera tradizzjonali lokali fadlilha futur f’pajjiżna.